That is as Unique as You Are. Tired of hearing "no" to custom feature requests? event ticketing, one idea at a time. Just like a great idea can disrupt an entire industry, we understand the impact your concepts can have on your business. that allow us to keep adding on new services, as requested by you. All your pages are automatically SEO optimized. 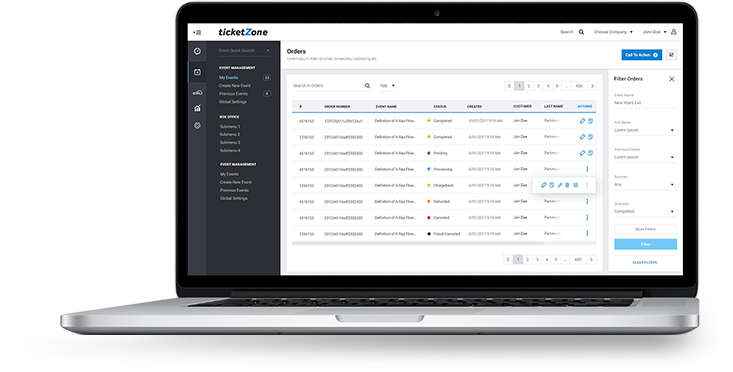 Sell more tickets, no matter what device your customer is on. Turn a retail partner into your sales center. Charge premium rates for the best seats in the house. Your events are syndicated to our affiliate network, helping you sell more tickets. Quickly set up links to track your sales team. Boost conversion rates by keeping the customer within your site design from start to finish. Up and running in just a few minutes. Turn off features your team doesn't need to see. Dedicated account manager to help you along the way. Need help at the gate? We'll be there with you! Credit cards are not stored on our servers. myZone has been helping bring events to life since 2002. Custom confirmation pages & email notifications reinforce important information / FAQs. Custom online waiver system saves time at the admission gate. Integrate with ZenDesk, Salesforce, MailChimp, Google Analytics and more. Using Linea-pro scanners, turn any iOS device into an incredibly convenient mobile box office or POS (point of sale) system. Print physical tickets on demand for faster admissions. By date or by volume. Post your event once, and we’ll keep it up to date everywhere. Big time saver for multi-day events! Survey customers with custom forms. Build remarketing lists for Google & Facebook. Quick integration with Google Analytics for real-time deep insight on your customers. Know all demographic information & location of your customers. Keep track of who (or what) is driving your sales. Use your own merchant account for super fast payouts in the USA & Canada. We integrate with Authorize.net, Beanstream, Stripe, Payflow Pro, PayPal and more! Our fraud detection system minimizes your risk of chargebacks. with automated email follow ups & remarketing tools. We’ll match the look & feel or your website, for free! No charge for printed tickets sold through ticketZone. Need a powerful website, fast? Our site builder technology allows us to build your event site at a fraction of the cost you’d expect. ... and we're just getting started! Click "get started" below to start posting your events, or "contact us"
to speak with one of our event ticketing experts.